Now that your inbox is your mailbox, should recalls be emailed? When you register a vehicle with a state, new or used, you are joining two important pieces of data – the Vehicle Identification Number (VIN) and your physical address. In the event there is a recall for your vehicle automakers will then use those two pieces of information to mail you a copy of the recall notice. Last week I ripped a $236.59 check in half and almost tossed it into the garbage. Why? It looked like every other piece of junk mail that I routinely toss out. In the past year I’ve received quite a few offers for extended warranties that are designed to look like vehicle recall notices. I don’t think I’m in the minority when it comes to trashing junk mail. If true – could people be throwing away their safety recall notices? This begs the question: how effective is the mailbox at reaching vehicle owners? 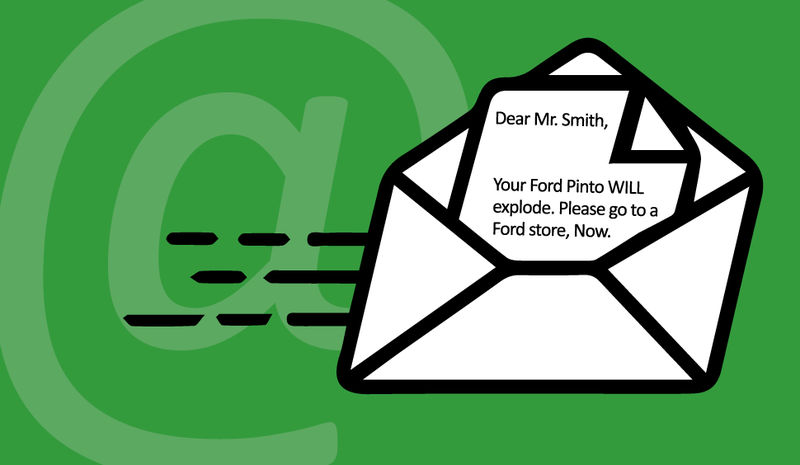 Is it time NHTSA and automakers modernize the recall process and transition from the mailbox to the inbox? What has the Secretary prescribed? Nothing. It appears the status quo, recalls delivered via first class mail, works well enough and achieves an acceptable rate of repair. Then why the legislative change? Last week I reached out to the House committee responsible for the language for more information. They did not respond. For the past two years I’ve advocated that dealers should offer to sign up new car buyers for recall notifications via Safecar.gov at the point of sale. I sent this idea to a few large automotive groups (Penske Auto Group, Auto Nation) and OEMs; not one responded. Email can improve the speed and accuracy of recall notifications. The sooner you can make vehicle owners aware of a recall the sooner they can remedy the situation. This also means that OEMs would need to rethink part availability and logistics. The current lag between NHTSA notification and vehicle owner notification does allow time for suppliers to produce and ship parts for remedy. If notifications are immediate, service bays could see people arrive for recall repairs before they have appropriate parts. Because NHTSA has no interest in changing the method by which automakers are required to send recall notifications, it’s likely automakers will make no effort to improve the process on their own. We live in a world filled with technology and instant communication, yet we choose to use a 200 year-old method to inform people that the vehicle they carry their family in everyday may not be safe to operate.